Meeting time is 12 PM. FRIDAY: We will walk for 4 hours, goal is 12 KM. and we will walk for an hour after sunset using the torches and the stars to guide our way. We will come back swim and have dinner and bonfire. 5:30 -11 am. (5 1/2 hours, goal of 12 KM) Sunrise and sunset in the desert are magical, something not to be missed! 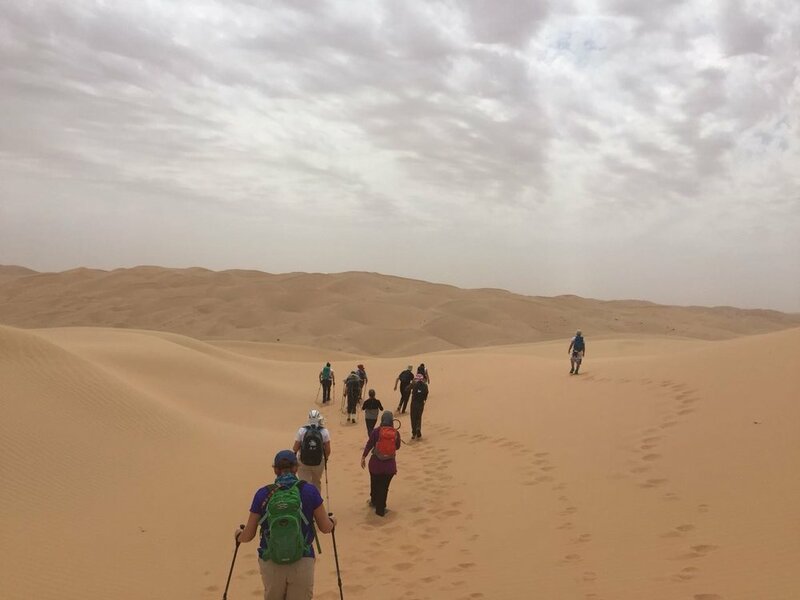 Even those that were unsure of how 'far they could go' ended up walking the entire time both days with the group and completing the entire distance. A support car is always nearby if needed. Everyone will have a 'rest stop' every hour which may seem like a lot, but this is the way we ensure that everyone stays hydrated and healthy. We will walk back into our camp for a full lunch and a jump in the spring-fed pool on site. Each rest stops will also have food,energizing snacks, and additional water available. You cannot see the stars like this until you are far away from the city lights. It's simply spectacular. The residence is fully equipped with three full bathrooms, all bedding needs, electrical outlets and an amazing spring-fed pool. At night guest choose a spot to sleep either on top of the dune, on the grass under the stars, or under the traditional arabic style majlis. This is an authentic experience in a small group, remote area. This event is open for all, but classified as a moderate hike due to the distance we walk through the desert. Meeting time is 12 PM in Liwa. Transport coordination by carpools. We will help organization of carpooling from Abu Dhabi and Dubai. Nobody is left behind.